When I started my voiceover career, I recorded in a tiny closet with accordion doors. The room is upstairs on the front of the house and faces the street. The only entrance to our subdivision is about 150 yards away from my house. Consequently, 99% of my 200+ neighbors must pass my house every time they enter or leave. To make matters worse, we live at the top of a hill. The neighbors step on the gas to get up that hill. I constantly had to stop my recordings every time a car passed. Moving to a walk-in closet across the hall helped to alleviate some of the car traffic noises. However, it didn’t help with the air traffic, leaf blower, lawnmower, and other noises around here. The county airport is not far from our house, so planes with small propellers are constantly flying overhead. In 2005, we decided to take drastic measures to reduce the noise. We started by replacing all of the windows on our house with triple-pane, casement windows. Instead of the common double-hung windows, which have 2 pieces that open by sliding them up or down, casement windows are one piece which opens outward. The movement forms a better seal to the house, and the 3 panes of glass with krypton gas between them significantly buffer outside noises. I bought a 6’x8′ WhisperRoom sound isolation booth. The WhisperRoom adds more density and air pockets in my quest for silence. Since the floor is on wheels, it can eliminate the low, rumbling noises that could be generated by passing trucks. What a joy to record in this room! I can’t remember a time when I had to stop work due to a noise outside the studio. I thought you might like to see and hear a short demonstration of the effectiveness of my studio. Using my iPhone4, I made a little video today after Drew started his motorcycle. I deliberately left the video in one continuous, unedited take, so I apologize in advance for any jerky movement. Turn your speakers up to really hear the difference! PS. If you’re considering a room addition on your house, you’ll want to absorb my lessons learned before you hire a contractor. Download your free copy of Karen’s Crash Course in Avoiding Ca$h-Poor Contractors. If it’s possible, I love traveling as much or even more than my voice-over work. In the past, I haven’t taken equipment with me on my trips. Since the beginning of this year, I have changed my equipment so that I can voice auditions and projects on the road. I now have a Macbook Pro laptop with Pro Tools LE running with a Mbox Pro mic interface. To facilitate the usual work here in my stunning soundproof studio, I just bought a Tranzport wireless workstation control, which will allow me to control and edit Pro Tools from within my booth while leaving the computer and other equipment outside the booth. 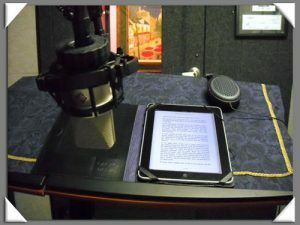 A while back, I had read Harlan Hogan’s excellent article about creating a portable booth. I couldn’t find the Reisenthel Home Box pictured in Harlan’s article at my local Container Store or at that company’s web site. However, I did find and order the box from Amazon. The company shipped it out immediately. It arrived this week, so I haven’t tried using it as a portable booth. I do have a lot of Auralex foam left over from the days when my recording booth was in a walk-in closet. 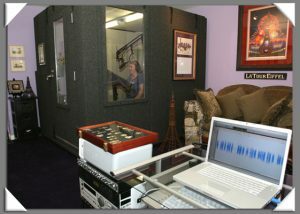 I had planned to leave my Neumann TLM 103 mic here in my recording booth and take my CAD condenser mic on road trips. The CAD mic is too heavy, and I’m now looking for a smaller, lighter mic to use in my portable configuration. I also have decided to sell my Telos Zephyr ISDN codec. I really don’t have much occasion to use it since I mostly work in long-form narrations and audiobooks. If you’re looking to buy an industry-standard ISDN unit, let me know soon! Otherwise, I will post the unit for sale on eBay. Speaking of travel, I need to travel away from home right now in search of brunch!